The ImmunoID NeXT Platform™ is designed specifically to enable the development of more efficacious cancer immunotherapies. While the success of checkpoint blockade has been hugely promising, the majority of patients who are administered these therapeutics demonstrate no response at all, with some even experiencing disease hyperprogression post-treatment (Kato et al., 2017). It’s increasingly apparent that predicting response to immunotherapies — and developing new ones — requires a more comprehensive approach to tumor immunogenomics. With highly-sensitive, exome-scale DNA and RNA analytics, ImmunoID NeXT™ addresses this problem; providing a multidimensional view of a tumor and its tumor microenvironment (TME) from a single sample. Figure 1: The ImmunoID NeXT Platform represents an end-to-end solution for immuno-oncology and all precision oncology applications. 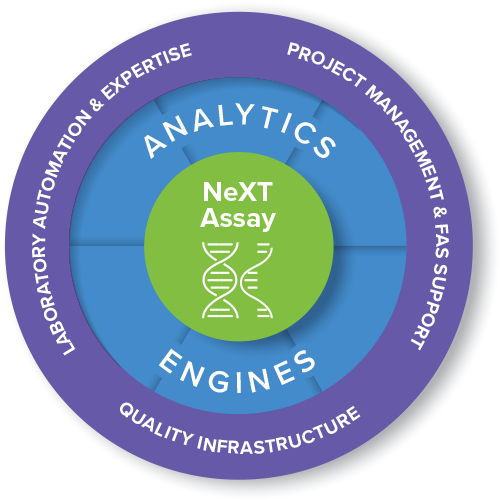 It combines the pioneering NeXT assay, sophisticated analytical engines, and quality support to provide researchers with the comprehensive immunogenomic data they need to drive their programs. With ImmunoID NeXT, oncology translational and clinical researchers can, for the first time, comprehensively analyze both a tumor and its microenvironment from a single tumor sample. 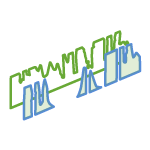 It enables customers to maximize the data generated from each sample while also decreasing the complexity of data interpretation by eliminating the need to integrate multiple assay technologies and reporting formats from several sources. Specifically built for immuno-oncology and all precision oncology applications, the ImmunoID NeXT Platform can be used to investigate key areas of tumor biology; from elucidating mechanisms of tumor escape and detecting neoantigens, to identifying novel biomarker signatures and characterizing the immune repertoire. With these extensive capabilities, ImmunoID NeXT effectively consolidates multiple biomarker assays into one. ~300X mean coverage across the entire footprint (>20,000 genes), ultra-deep coverage of TCR/BCR gene regions, as well as clinical-grade coverage across ~250 targeted therapy cancer driver genes. 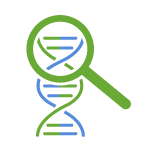 ImmunoID NeXT utilizes our proprietary ACE Technology to provide augmented coverage of difficult-to-sequence gene regions across the entire ~20,000-gene footprint. 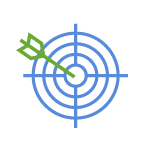 Enhanced targeting of HLA genes, MSI-related loci, as well as oncoviral genes to enable the accurate characterization of investigational and predictive precision oncology biomarkers. Accurate detection of SNVs, indels, and gene fusions, including low-abundance mutations, which is critical for the analysis of samples with low tumor content. 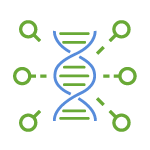 The Personalis framework of analytical pipelines integrates both proprietary and industry-leading in silico tools to generate the most informative and usable insights from the comprehensive raw DNA and RNA data. Personalis’ protocols optimize nucleic acid extraction from difficult formalin-fixed paraffin-embedded (FFPE) samples. This approach enables dual extraction of both DNA and RNA from the same, precious tumor sample. 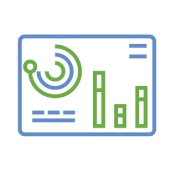 ImmunoID NeXT analytics leverage the accurate, raw data to evaluate the status of the most relevant oncology biomarkers, as have been identified and investigated in the literature. Figure 2: ImmunoID NeXT analytics modules provide insights into the complex interactions between tumor cells and the immune cells of the TME. RepertoireID enables the analysis of the TCRβ clonotypes in patients’ tumor FFPE (as well as fresh frozen) samples. 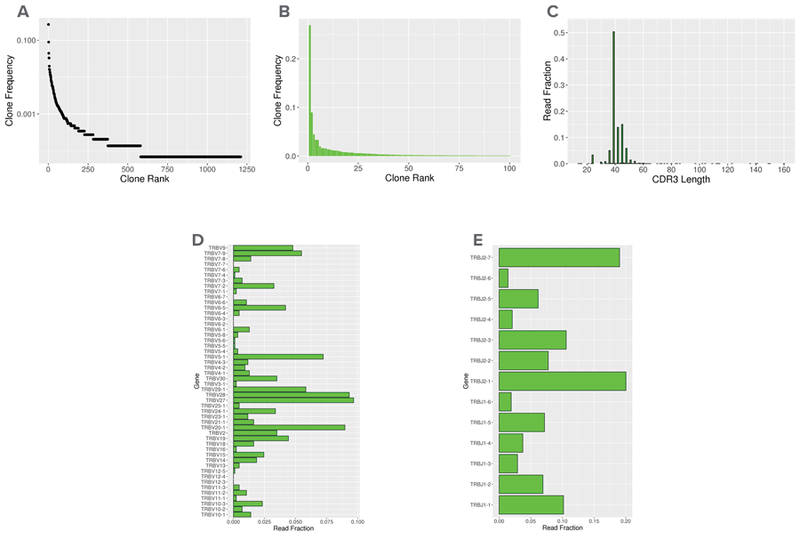 The ultra-deep, TCR-specific RNA sequencing data derived from the NeXT assay is processed by our TCR Analytics Engine, and a report is generated providing key metrics such as clonality; CDR3 nucleotide and amino acid sequences; clonotype quantitation, distribution, and frequency; V, D, and J gene segments usage and overlap; and CDR3 nucleotide sequence length. These deliverables enable researchers to investigate the TCR repertoire’s potential as a predictive biomarker of response to immunotherapies and combination therapies. 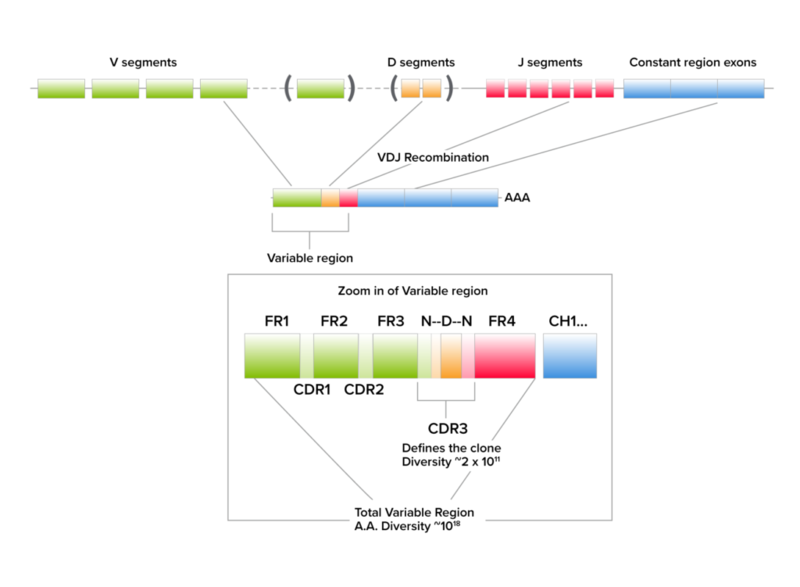 Figure 4: Example of the information delivered via RepertoireID, including (A) Clonal Frequency Distribution; (B) Top Clone Distribution; (C) CDR3 Length Distribution; (D) V Gene Usage; and (E) J Gene Usage. This data is from an FFPE sample that was processed at Personalis. 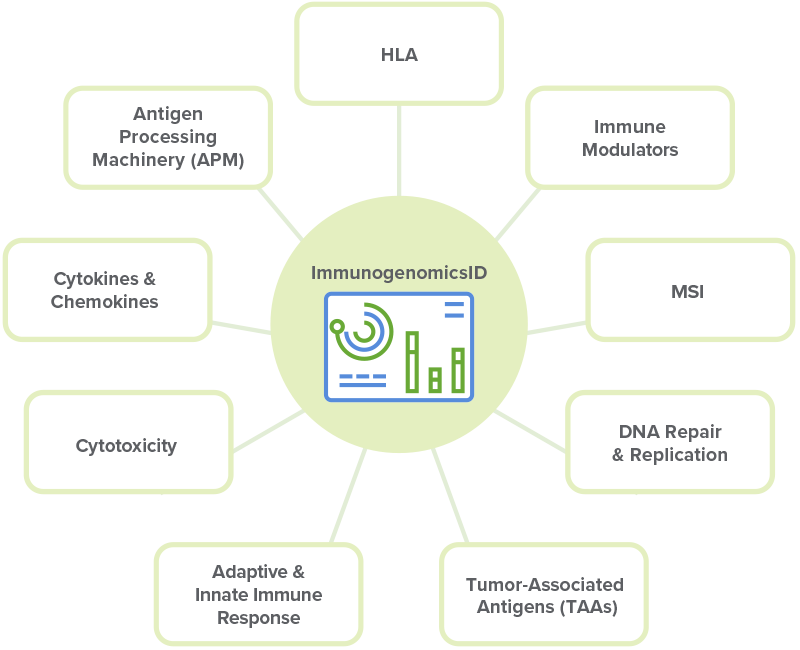 ImmunoID NeXT is the first commercial platform that enables the comprehensive characterization of the immune repertoire using data derived from an augmented, exome-scale platform, designed specifically to explore multidimensional oncology biomarkers. Figure 5: ImmunogenomicsID delivers biological insights into each of the highlighted biomarkers and functional areas of tumor biology. 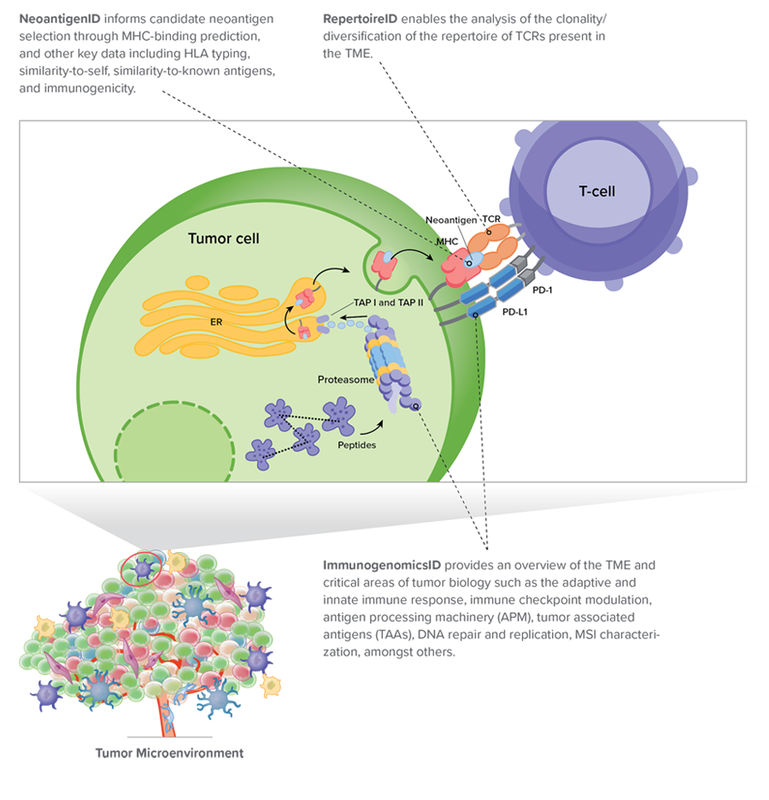 ImmunogenomicsID provides an overview of TME-related biomarkers and critical genes that are involved in, or highly impact key oncology functional groups including antigen presenting machinery (APM), DNA repair and replication, immune checkpoint modulation, tumor associated antigens (TAAs), adaptive and innate immune response, cytokines and chemokines, and cytotoxicity. Utilizing an industry-leading algorithm, ImmunogenomicsID also provides a characterization of MSI within a tumor sample, highlighting the stability status of five canonical loci, as well as the proportion of all microsatellite loci that are found to be instable. Deep and uniform coverage (of both DNA and RNA) is critical for both comprehensive neoantigen identification and the accurate assessment of neoantigen load. ImmunoID NeXT ensures highly-sensitive variant detection via both the depth of sequencing (~300X mean coverage) and the augmented coverage of difficult-to-sequence regions across the entire >20,000 gene footprint. Combined, these features reduce the chances of neoantigen-producing variants (SNVs, indels, and fusions) going undetected. NeoantigenID utilizes the tumor and matched normal ImmunoID NeXT configuration to accurately differentiate between somatic and germline mutations and to generate analytics for the identification of potentially immunogenic neoantigens, incorporating information such as HLA typing, MHC-binding prediction (for Class I and Class II), similarity-to-self, similarity-to-known antigens, and immunogenicity. In addition to the identification of putative neoantigens for personalized therapeutic development, NeoantigenID also provides an evaluation of the mutational landscape of the tumor, delivering both the neoantigen load and TMB for biomarker discovery applications. 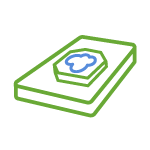 Want to learn more about the ImmunoID NeXT Platform?